Very successful Group Practice with four busy Board Certified surgeons in Southeastern, MA seeks a BE/BC General Surgeon, preferably with advanced laparoscopic and robotic skills. Competitive salary/bonus and fringe benefits package provided leading to early partnership opportunity. On-call is shared equally within group/community. Access to Boston & Providence. Outstanding out door recreation activities at nearby ocean beaches and neighboring mountain ski areas. Founded in 1987, Truesdale Surgical Associates, is an independent Fall River surgical practice providing quality care from highly experienced surgeons. With our high regard for the doctor-patient relationship, we are focused on serving you, not a healthcare bureaucracy. Here, you'll find a high regard for the doctor-patient relationship. A partial list of our specialties spans general, colorectal, breast and thyroid surgery, and for each we employ the most advanced and safest techniques using the least invasive methods. Truesdale Surgical is an affiliate of Steward Health Care. Steward Health Care, the largest private hospital operator in the United States, is a physician-led health care services organization committed to providing the highest quality of care in the communities where patients live. Steward’s unique health care service delivery model leverages technology, innovation, and care coordination to keep patients healthier. Steward operates 36 community hospitals in ten states that employ approximately 37,000 people and regularly receives top awards for quality and safety. The Steward network includes more than 26 urgent care centers, 42 preferred skilled nursing facilities, substantial behavioral health services, over 7,300 beds under management, and more than 1.1 million covered lives through the company’s managed care and health insurance services. 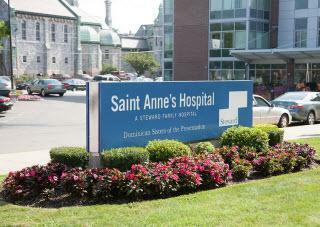 Saint Anne’s Hospital, a Steward Family Hospital, is a 160-bed, acute-care community hospital with comprehensive inpatient and outpatient services that provides care to southeastern Massachusetts and Rhode Island. We offer specialized services in oncology, pediatrics, diabetes, orthopedics, cardiac care, rehabilitation, behavioral medicine, and pain management. Steward Health Care, the largest private, for-profit hospital operator in the United States, is a physician-led health care services organization committed to providing the highest quality of care in the communities where patients live. Headquartered in Boston, Massachusetts, Steward operates 38 community hospitals in the United States and the country of Malta, that regularly receive top awards for quality and safety. The company employs approximately 40,000 health care professionals. The Steward network includes more than 25 urgent care centers, 42 preferred skilled nursing facilities, substantial behavioral health services, over 7,300 beds under management, and approximately 1.5 million full risk covered lives through the company's managed care and health insurance services. The total number of paneled lives within Steward's integrated care network is projected to reach 3 million in 2018. Steward's unique health care service delivery model leverages technology, innovation, and care coordination to keep patients healthier. With a culture that prioritizes agility, resourcefulness, and continuous improvement, Steward is recognized as one of the world’s leading accountable care organizations. The Steward Health Care Network includes thousands of physicians who help to provide more than 12 million patient encounters per year. Steward Medical Group, the company's employed physician group, provides more than 4 million patient encounters per year. The Steward Hospital Group operates hospitals in Malta and states across the U.S. including Arizona, Arkansas, Florida, Louisiana, Massachusetts, Ohio, Pennsylvania, Texas, and Utah. The City of Fall River, Massachusetts is located in the historic Southcoast region of Massachusetts.